TransRush is a set of cinematic style transitions created exclusively for Final Cut Pro X. With TransRush, video editors can easily adjust animation direction with drop-down menus and apply subtle stylization with simplistic sliders. Create seamless transitions with drag and drop easy with TransRush presets. 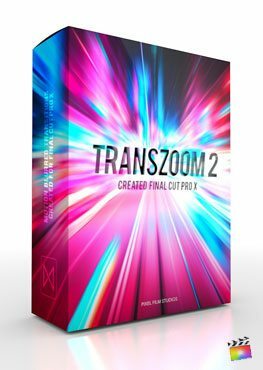 TransRush is a set of dynamic transitions created exclusively for use within Final Cut Pro X. Seamlessly transition between scenes with sliding and rolling presets without having to set a single keyframe. To use TransRush, simply drag a preset and place it between two clips in the FCPX timeline. Adjust the transition handles to adjust the duration of the transition. TransRush allows users to adjust the chromatic aberration, exposure, and blur amount with incredible ease. Increasing the prism amount adds a touch of realism to the camera movements. Bumping the prism to extreme levels will create more abstract looks. Increase the brightness to better blend the movement of the camera and the transition clips together. TransRush allows editors to easily alter the direction of transitions with drop-down menus. With “Corner” transition presets, Final Cut users can determine where the first scene will animate to, and also where the new clip will animate from. Mix and match drop-down menus options for an array different animation combinations. TransRush features both regular and motion blurred animation options. Motion blurred presets simulates the blurring effects that occur when shifting a camera too quickly. These presets take a little longer to render but make for a more cinematic look and feel. With non-motion blurred presets, users can enjoy faster render speeds with the same customizable options. Where do I find TransRush? 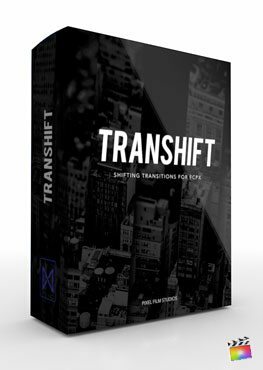 Once the installation is complete, you can find TransRush in the FCPX Transitions library.